At first glance it may appear as a basic crime investigation show but that's purely surface. Underneath the familiar exterior lies a show with a lot more to say about morality, good and evil and other matters of character. The main character has a duality about him that will keep you watching his every move from start to finish. While i suspect people will say the case they working on is weak from a story point of view, I would say the cases in this show are meant to be far less interesting than the way the the characters manipulate them. Watching our golden boy make decisions to further his career is what I feel will be the main draw of this show. Seeing his ambition and pride blind him and causing lapses in judgement or conscience is where the real drama will shine through. The way the writers have him navigate between the light and dark can make this show as high a caliber as Breaking Bad, if they were to make the title a misnomer. Watching our protagonist start slowly down a path of corruption to further his career and protect his sister could make this a great character study. The acting is the last thing I will touch on and I will say its superb for a pilot episode. 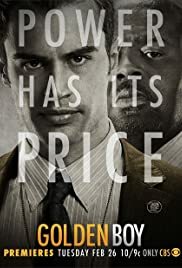 Theo James performance is perfectly layered with presenting us with a supercop exterior but giving us glimpses of fear and uncertainty that his character has to contend with. Chi Mcbride brings his veteran acting skills which compliment his characters veteran status on the police force, creating one of the most believable and sympathetic performances of a cop on television. Holt Mcallany while in just a supporting role manages to steal each scene hes in with a certain charm and levity that he brings to his character. The closest thing to comic relief in the show his character of detective Joe Diaco could turn out to be a fan favorite if given more screen time. Golden boy is a show that's well worth your time if you're tired of all of the run of the mill crime investigation shows and you're looking for a cop show that could contain a rich and meaningful character arc. 69 of 79 people found this review helpful. Was this review helpful to you?